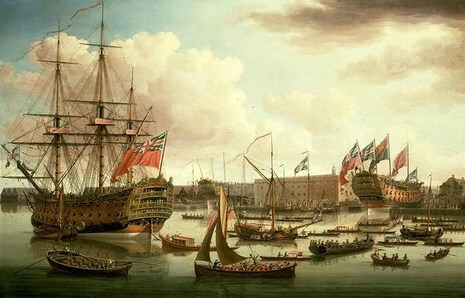 The first-rate ship HMS Royal George was laid down as the Royal Anne but renamed in honour of the reigning monarch George II before her launch in 1756. The first warship to exceed 2,000 tons burden, Royal George was commissioned at the start of the Seven Years' War with France and joined the Western Squadron in blockading the port of Brest and Quiberon Bay. On 29 August 1782 whilst undergoing minor repair work at Spithead, the Royal George began to take on water. She capsized and sank very quickly with the loss of about 900 lives. The dead included Rear Admiral Richard Kempenfelt and as many as 300 women and 60 children who were visiting the ship at the time, prior to their husbands and fathers departing Britain’s shores. It was reported that all of the children but one lost their lives; a single little boy surviving by clinging on to a sheep which had been on board. After breakfast, Captain Waghorn was on the upper deck when the carpenter announced that the ship appeared to be settling into the water. The guns were ordered to be run in and the weather side guns were run out in order to right the ship. Drummers were ordered to beat to quarters. Minutes later, the ship sank with no warning, not heeling over at all. No accurate number is available for the amount of people who were drowned in the disaster because of all the extra dockyard workers and visitors to the ship, such as women and children visiting the men. It is claimed that over 300 people survived, but figures for those lost range from 900 - 1200. Admiral Kempenfelt was among those lost, although Captain Waghorn was among those rescued.